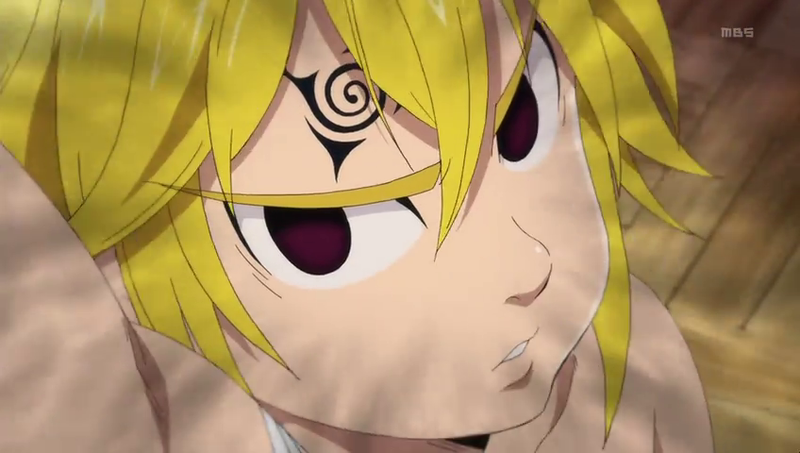 What does the seal on Meliodas's forehead mean? How did he get this seal? In episode 5, when the enemy tried to steal his sword, this seal appeared on his forehead. It is the symbol of the demon clan. Meliodas is a demon. This advancement is explained in the Manga. Although it is hinted throughout the series, but it is never really explicitly shown that he really isn't human until after the Kingdom Infiltration arc has ended. The Ten Commandments, a group of the most fearsome demons are revived. They were sealed 3000 years ago, yet Meliodas knows them all by their names. King confronted him claiming he was a demon. Although he didn't answer, it is obvious from the situation. That also accounts for his never aging body.The Ten Commandments know him well too. And Meliodas actually calls them his brothers in chapter 135. So, yeah, he is a demon. Later on in the manga, his past and identity is explicitly revealed to be one of the Ten Commandments. It is the symbol of the Demon Clan. Meliodas is a demon. When he uses his demon powers, his eyes turn black and the Mark of the Beast, the symbol of the Demon Clan, appears on his forehead. Meliodas is the demon king's unholy knight. He violated demon law by developing an interest in humans and for this betrayal was banished to the human world to live as a normal human. Something went wrong and deeply weakened the seal that contains his ultimate powers. Little by little his demon powers return. Although he has only a fraction of his power back and it will take millenia for his powers to return in full, it has to make you wonder how strong the demon king would be unless Meliodas IS the demon king himself. Meliodas is a full demon, and the eldest son of the demon king. He can be killed (Estarossa stabbed all his hearts) but will come back to life about a month later. I'm guessing each family of demons has a different mark, so Zeldris, Estarossa, and Meliodas have the same thing. Say, Derriere has a different one than them. The mark signifies that Meliodas and his brothers are from the ruling class as the demon king has the same seal or you could say it’s because he’s the demon King’s son. The marks on the others is a representation of their commandments. Why is Nanatsu no Taizai : Seisen no Shirushi only 4 episodes? Why exactly was Meliodas only half-conscious after breaking out of that crystal prison? What's the song on season 2 episode 24 when Meliodas was cooking something and Elizabeth came to meet him? What’s the song of Nanatsu no Taizai season 1 episode 18 remaining 2:56 minutes?